We've recently had a discussion at work about how amazing Puerto Rican food is and how hard it is to find in the capital district. Could you ask your readers for suggestions? Personally, I've been looking for a place since I came home from a visit to the island back in 2003 with real tostones. For now we make our own, but I'd LOVE to find a place to go for dinner or even get good take out. Obviously, if there's a restaurant primarily focused on Puerto Rican food, please mention it. 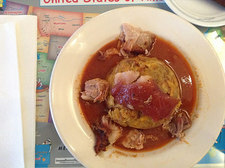 But we're betting there are at least a handful of restaurants that offer some Puerto Rican dishes, like the mofongo at Casa Dominicana. Got a suggestion for Cheryl? Please share! I also love Casa Dominicana. I've heard great things about Flores Family Restaurant in Schenectady too. I've been lamenting this local lack of cuisine for years, especially as an Amsterdam native where there is such a rich Puerto Rican culture. Boricuas of the Capital Region, please make this happen! La Marqueta ( formerly Frank and Giovani's) on lower Morton Ave has a great steam table of Puerto Rican and Dominican food. It's also very affordable. They also carry homemade pasteles in the freezer section as well as sofrito. The chicken wings are phenomenal and if you want to do Caribbean cooking have an excellent selection of products. I second Emily, la Marqueta is great for takeout.